A 19 year old Orillia woman was stopped from getting onto the road after she accidentally backed into a parked vehicle, and witnesses realized she’d been drinking. The young woman was then blocked by another driver, to stop her from driving off, while other bystanders called the police. After arriving on the scene, Orillia police officers administered a breath test to the young woman, which she failed. She was charged with two counts of impaired driving and the office thanked the individuals for their quick thinking that possibly helped save lives. The reality is that impaired driving is a very serious and ongoing problem that often results in the serious injury and death of many individuals. According to Statistics Canada, a 2011 Uniform Crime Reporting survey concluded that there were 90,277 impaired driving incidents in the Canada, with 839 of the accidents resulting in severe bodily harm and 121 in death. The actions of the individuals in stopping the young woman from getting onto the road, serves as a positive example for many others and an illustration of how as individuals, we can all do our parts to minimize the high incidence of impaired driving. Mothers Against Drunk Driving (MADD) suggests that when in a situation with an impaired driver, talk to the impaired individual in as non-confrontational a manner as possible, offer to get them a cab, or take their keys and give them a ride. Choose a designated driver if you plan on hanging out in a group and make sure that the chosen individual is staying true to their role. Hide an individual’s keys if they are clearly impaired and being confrontational and difficult about not driving. Never serve alcohol to minors. If you are throwing a party, serve non-alcoholic as well as alcoholic drinks and try to arrange alternate transportation for anyone who appears to have had too much to drink. If you are driving and notice someone swerving, braking and taking turns erratically and they clearly seem impaired, keep a safe distance and call the police. It is important to note that impaired driving is more than simply drinking and driving. It also includes driving under the influence of drugs, including prescription medications as well as illegal substances. In fact, accidents caused by individuals driving under the influence of legal, prescribed drugs is very common and the risks are just as high and potentially deadly, as for accidents caused by drunk driving or being under the influence of illegal drugs. Many of the same suggestions about stopping an individual who is impaired by alcohol, also applies in a situation of someone driving under the influence of drugs. If you know someone has taken prescription drugs for example and they should not be driving, try to get their keys away from them, offer them an alternative form of transportation and if all else fails, call the authorities. Another form of impaired driving that rarely gets as much attention as drunk driving and/or driving under the influence of drugs, is fatigue. Many accidents are caused by individuals driving when exhausted. Doctors for example, who work long hours/shifts and truck drivers who drive for hours to different cities and provinces, are all at a high risk of being impaired by fatigue. And fatigue, like all other types of impaired driving can cause major accidents, which results in mild to severe and catastrophic injuries, as well as death. Sometimes, a person who is swerving and driving erratically is doing so not because they are drunk or under the influence of drugs but because they are tired and falling asleep. It is still important in these times to call the police, in order to avoid a catastrophe. 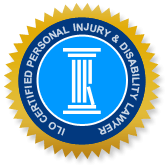 The experienced and compassionate lawyers at Personal Injury Lawyers of Ontario (ILO) have represented many individuals in Orillia and the surrounding area, who have been victims of accidents caused by impaired drivers. We understand how difficult, emotionally and physically, this experience and time can be for accident victims and are readily available to advise you as to your best options. If you or someone you love has been the victim of an accident due to an impaired driver or any type of careless driving, please do not hesitate to call. If you are unable to come to us, then we can arrange a consultation in your home or at the hospital.